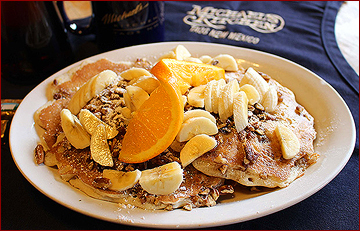 Considered one of the best restaurants in town, Michaels Kitchen offers an extensive menu of Spanish and American dishes. Weekdays, choose from a rotating menu of $7.95 lunch specials, including a beverage. Dinner is now served weekend nights - just be in the door by 8pm. And you can always enjoy breakfast - all day, everyday. Don't forget to bring home some delicious fresh-baked pastries and bread! As always, Michael's Kitchen prepares everything from scratch. 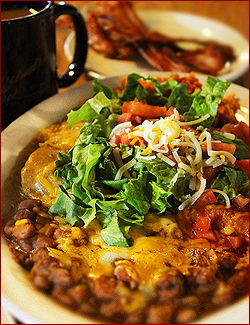 Patrons have been enjoying breakfast dishes such as bacon and eggs, huevos rancheros, breakfast enchiladas and Michael's Kitchen's own Poor Mans eggs benedict, smothered in red, green or veggie-green chile since 1974. 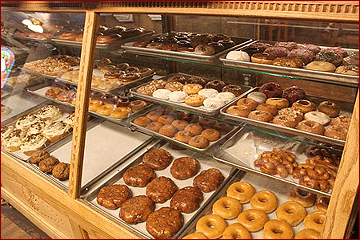 All the pastries, English muffins, breads, cream puffs, doughnuts and cinnamon rolls are baked fresh daily in their downstairs bakery, which produces up to 175 different delectables depending on the season. One of the favorite lunch dishes is called the Belly Buster, and is well named! It's a burger with two patties, four strips of bacon, four slices of American cheese, avocado, diced green chile with lettuce, onions, pickles, tomatoes and French fries. And this is only one of many mouth-watering choices. Enjoy a Hamburger, Avocado or Tuna Club, a Taos or Philly style cheesesteak sandwich, or a number of traditional and not-so traditional sandwiches. Treat Yourself to a $7.95 Lunch Special! On a busy day the restaurant will serve up to 1200 people, 136, more or less, at a time. They make 50 gallons of red and green chile every day. On weekends they prepare about 330 dozen eggs for breakfast. Dinner favorites include an Indian taco, which is a flat sopapilla covered with beef or chicken, onions, cheese and is smothered in chile with rice and beans. It also comes with a sopapilla on the side. In addition, they make delicious crunchy breaded chile relleneos, stuffed sopapillas and a build-it-yourself combination plate with anything on it your heart desires. Of course there are salads and burgers, as well as a kids' menu. And don't forget to treat yourself to some delicious nachos, guacamole salad or ask your server about Mickey's Mess smothered chips. And for desert, enjoy delicious fresh-baked pie a la mode or a sundae. Treat Yourself to a Good Old-Fashioned Fresh-Baked Pastry! People come from all over just for Michael's Kitchen's freshly baked pastries and breads. Enjoy cream puffs with the freshest whipped cream, stuffed long johns and eclairs. And Michael's Kitchen is famous for their huge cinnamon rolls. You'll also find pinwheels, cake doughnuts, and cream cheese danish with toppings of fresh strawberries, blueberries or peaches. Michael's Kitchen Provides quality take out food service for parties, family meals, business gatherings and special events. Relax and entertain your guests, knowing they will enjoy some great food. Take out catering is a fast, affordable and easy solution for any event. Michael's prepares your favorite dishes from the restaurant for your special event, such as green and red chile enchilada trays, pinto beans, Spanish rice, homemade Guacamole and chips etc. Choose from several sizes to accommodate your particular needs. Visit the Michael's Kitchen website catering page to choose your menu. Any item on the regular menu is available for personal breakfast, lunch or dinner take out on weekends. Just give Michael's a call to place an order for pick up. Gift certificates and shipping for many popular items is also available. 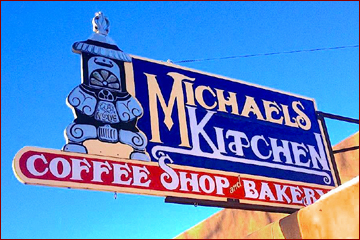 Michaels Kitchen Coffee Shop & Bakery is a legendary Taos icon with a tradition of authentic Northern New Mexico cuisine. Its the place of choice for locals and tourists alike. So visit Michael's Kitchen soon, and make sure you come with an empty belly!